Last week I had the pleasure of attending the Kent Computing Conference (#KentCS). 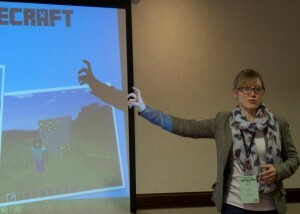 I was there to present two workshops in the afternoon, one on Kodu and the other on Minecraft & Python. First; I was lucky enough to be able to spend the morning enjoying two excellent keynotes and a workshop by Phil Bagge. I’ll summarise the key information below. Algorithms – a good example was shown where pupils would create a flowchart of getting up in the morning, broken down into small steps. 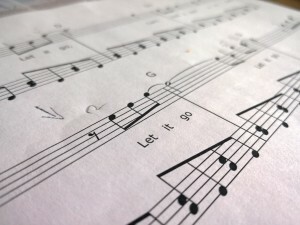 Decomposition – breaking a process down into manageable chunks, he discussed how it was beneficial to do this both as a class and as individuals. Paul Powell’s Unplugged Networking Lesson – Demonstration of communication using pieces of string to form the network. He then discussed problem-solving approaches and looked at decomposing as one method, showing an example of a simple balloon game to which we, as an audience had to work out the rules that made it function. 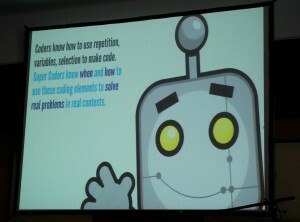 I can see this being an excellent way to make students think about programming and algorithms. Max also mentioned “Rubber Ducking” in which students would explain their program to a rubber duck in order to verbalise what they are doing in their programs. Minecraft & Raspberry Pi – In this session I covered some basic Python programming techniques that can be used with the Raspberry Pi version of Minecraft. Click here to download the PowerPoint from the session. Game Creation in Kodu Game Lab – Here I covered the basics of how to create a simple game in Kodu Game Lab and introduced delegates to the Kodu Kup. Click here to download the PowerPoint from the session. The conference finished with David Brown from OfSted ironing out a few OfSted myths which I found quite interesting. In relation to my subject he highlighted the importance of regularly ensuring children and ALL staff are aware of e-safety procedures and how to deal with issues. He advised delegates to read the School Inspection Handbook to keep up-to-date with OfSted procedures. 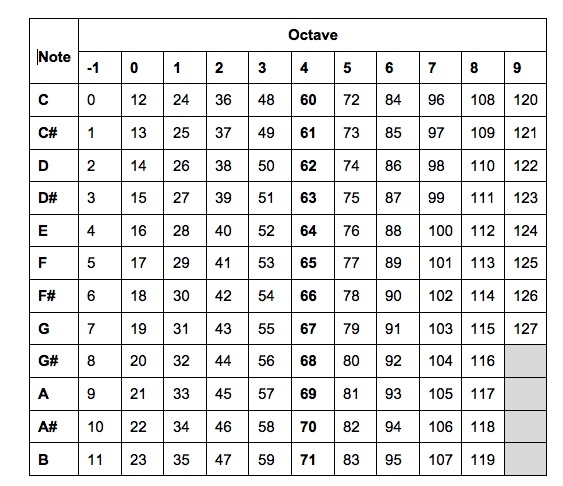 One point I was particularly pleased David raised was that of recording aural feedback. In Computing we often give out feedback aurally and I know colleagues in other schools have been required to find ways to record this, I’ve often thought of this as a pointless activity, one that exists purely to tick boxes when in reality the time spent recording the feedback would be be better spent actually acting on said feedback! 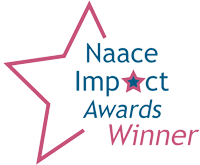 David made it very clear that it is NOT an OfSted requirement to record aural feedback so I was really pleased to hear this! So you’ve probably noticed I’ve been a little quiet this (school) year with my last post being back in September. Last term was super busy having moved house in the middle (and still haven’t finished unpacking), with that and starting and assessing the new Computing curriculum with Key Stage 3 and a very successful Hour of Code in December, I’ve not had a lot of time to focus on my blog! 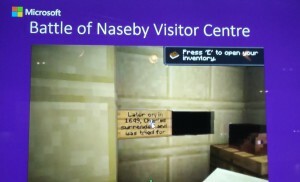 My first visit was to the Microsoft stand which was rather nicely decorated with Minecraft paraphernalia. Following with the Minecraft theme, the first talk I was keen to attend was on Minecraft in Education by my friend Ray Chambers, his talk was very interesting about how Minecraft had been used in different ways in his school; firstly as a fellow Computing teacher he had been experimenting with Red Stone to simulate logic gates. I had a go at this myself, and after a quick Google managed to construct AND, OR and NOT gates without too much difficulty (as shown on the right). 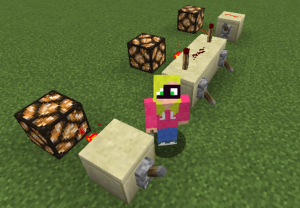 In terms of programming, Minecraft also comes up trumps enabling children to create their own mods for the game, this allows them to customise their world with any number of goodies, including dinosaurs, mutant creatures, magic, you name it! Ray continued to discuss the uses of Minecraft, not only in Computing but in a cross-curricular context too. Firstly Minecraft allows you to simulate your own farm, growing crops and raising livestock providing vital food and energy for your player, not to mention a means to trade with local villagers. Being so flexible there’s no end to what you can do in class. One such example was the construction of the trenches in a history lesson on World War 1. Another student in his school even completed an open-ended History homework about the Battle of Naseby by creating a simulation of a visitor centre giving all the required information. Lastly, Ray mentioned a useful online resource to get started, Stampy Cat on YouTube provides a range of tutorials for beginners. I’m currently investigating the use of Minecraft myself, I’ve been using the Raspberry Pi version and programming it using Python, I’m presenting a workshop on this topic along with Kodu at the Kent Computing Conference on 30th March. On the Microsoft stand they were also giving out Computing at School’s Quickstart Computing booklet which is a very useful toolkit available for both primary and secondary teachers of Computing. This is also available to download from here. My main reason for visiting the Google stand was to learn more about Google Classroom as we have adopted this fantastic VLE in school and I was keen to know more about any upcoming features. There was a talk about this in the afternoon but unfortunately I got distracted and missed it! If anybody wants to share any info from this in the comments below I’d be really grateful! 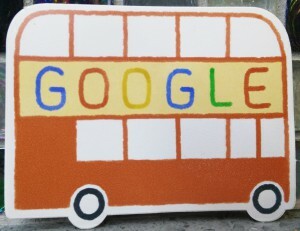 I did manage to discuss how to go about organising a trip to Google in London as my students are frequently bugging me about this! I was told the best way is through an existing contact in school. I know our network technician has a contact so I am going to try that approach next. Also on the Google stand I learnt about two interesting looking apps; TinkerCAD, which allows you to create 3D drawings in your browser and Pixlr, an online photo editor. I’ve always had an avid interest in Lego and as we already have Mindstorms NXT in school (and at home) I was keen to see if there was anything new to check out. Mindstorms EV3 looks pretty good but I don’t think it has a huge amount more functionality than our existing Lego kits (although the connectivity looks better). While listening to one of the talks on the stand I did discover a programming environment called RobotC which allows you to program the robots using text-based language rather than the visual editor, however I later learnt that it is a little too pricey for my non-existent department budget so I’ll probably stick to Python and my BrickPi instead. I haven’t really been involved with the Kodu Kup this year but I was keen to see the launch over on the XMA and Viglen stand at midday. Stuart Ball announced the competition along with some children from a visiting primary school. The competition looks really interesting this year with a heavy weighting being on the business side of the game. I’m hoping to enter the competition with some of my keen year sevens. The Raspberry Pi stand featured lots of goodies, I particularly like their little lesson cards linked to the lessons on the Raspberry Pi website. 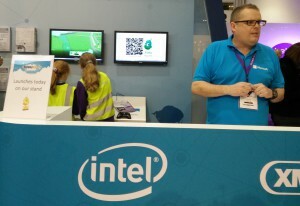 They were also promoting a Kickstarter project called Flotilla which offers a treasure chest of electronic goodies to connect to the Raspberry Pi. 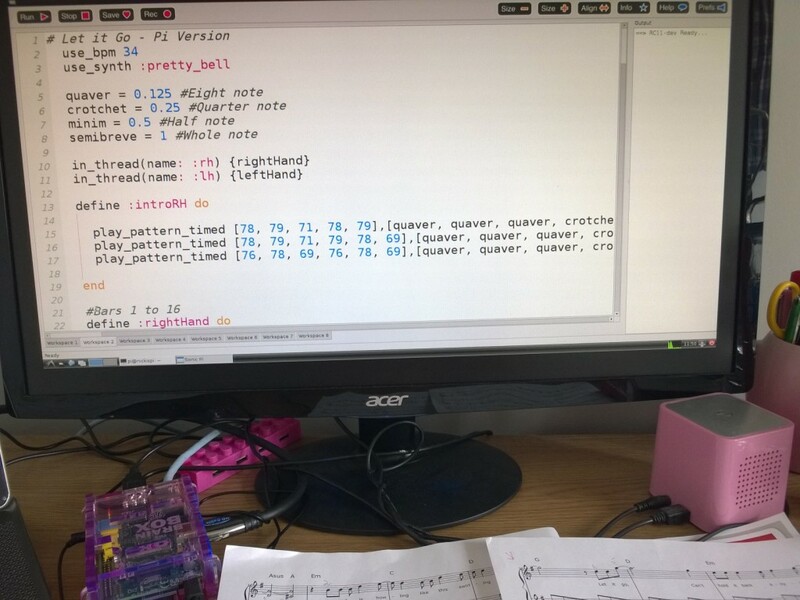 There was a range of talks over on the stand and one that I wanted to attend was about Sonic Pi – Audible Computing, allowing you to program your own music (you may have seen this in my previous “Let it go . . .” post). Unfortunately I missed this as it clashed with another session I needed to attend. While eating my lunch I managed to check out this fantastic show in the Bett Arena by Fran Scott. The show was excellent with the explosions taking the form of gas-filled balloons programmed to explode using a Raspberry Pi. This was a cut-down version of a bigger show that you can find out more about here. I’d love to have the team visit my school, it would be particularly good at the moment as year 9 options evening is looming! I’m not sure my budget will stretch that far though! One part of the act I particularly liked was when Fran threw various computer components across the stage to make the point that a computer is still a computer without a keyboard, mouse or monitor attached. This is something my students often find difficult to understand so I might try this approach in class (maybe with already broken peripherals though!). Linx Tablets; an affordable tablet and ideal for 1:1 devices in school. I’m currently trying out the 10″ model. That’s my BETT low-down, please add comments below if I’ve missed any good bits! I’ll try not to leave it so long before my next post! Nicki July 13, 2014 2 Comments on It’s Geekness Day! A few weeks ago I received an email informing me that today, 13th July, is officially known as “Geekness day” and I was asked to embrace my inner geek by writing a blog post and answering a few questions, so here goes . . . So what makes me a geek? Well, I guess it’s a combination of my hobbies, interests and career. I’ve always been into computers and since college I’ve loved programming. I work as head of Computing at an all girls school in Kent so get plenty of opportunities to “get my geek on!”. Currently trying to find more time to play with my Raspberry Pi! My proudest geek moment? . . . Without a doubt that has to be my wedding day last year. 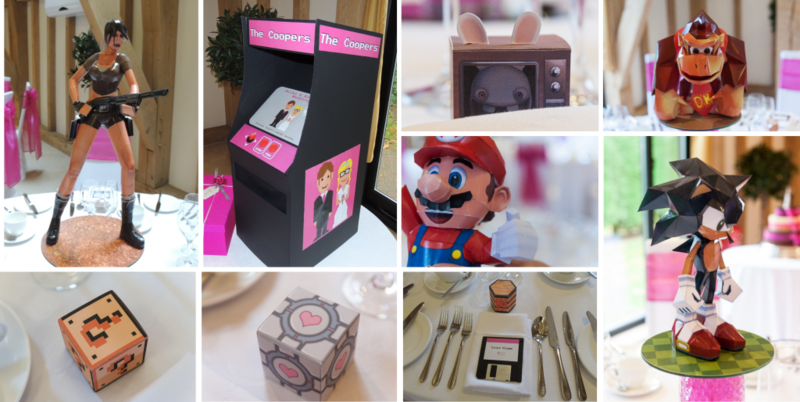 My husband and I decided to have a computer game themed wedding so each table was themed around a different game. I spent the whole of my summer holiday last year (and some) creating papercraft centerpieces to signify each game and we used floppy disks as placeholders. Even the gift boxes stuck to their table’s theme with question boxes for the Mario table and barrels for the Donkey Kong table (and everything in between!). My dad even helped out too by constructing an arcade box for us to use to collect cards from our guests. One of the highlights was that I had also organised for the string quartet to play the theme tune to Sonic the Hedgehog, which is my husband’s favourite game! Lastly, my geek role models, would probably be Ian Livingstone and Belinda Parmar. Ian Livingstone is not only the author of many of the Fighting Fantasy books and creator of Tomb Raider, but also a very inspiring speaker about the games industry as well as gaming in education. Belinda is the author of Little Miss Geek, and has spent a lot of time addressing and encouraging more girls and women to enter tech-related careers. Belinda was part of my inspiration for launching my Geeky Barbie’s Adventures site, documenting women in the IT industry so the girls I teach can see and read about role models in various careers.